3 Great Tips for Making Bath time Fun! Help make bath-time a fun to-do for your kids! Our toddler mode has kicked into overdrive since our munchkin turned two last month. Now that Bellamy has a mouth full of teeth, wants to spend 8 hours playing in her bath water before getting washed and wanting to use her washcloth on her own we figured it was a good time to give her bathroom a little makeover! Her interest in grooming herself got me researching the perfect theme I knew she'd go nuts over. Here are a few tips that will excite you and your little ones about splashing around, brushing their teeth and taking care of themselves. I'm a minimalist when it comes to home decor so I definitely believe less is more. When approaching this topic with my husband (Sean) he was totally against transforming Bella's bathroom as he didn't want it to look overly "kiddie" and cheesy, with that in mind I found the cutest Sesame Street decor that is so adorable AND very stylish. Land of Nod [recently re-branded as Crate & Kids ] did a collaboration with Sesame Street this year and all of the bathroom pieces are too cute! Bella is crazy over all of the characters so we knew she was going to love everything about her new space. The ABC Shower curtain was perfect as each letter resembles the characters and follows the first letter of their name. If you dont want a colorful curtain you could always go with a toned down shower curtain and choose colorful towels and bath mats to brighten the space and keep it youthful. P.S. I will always be brand loyal to companies that get me and my style! Thank you Crate & Kids. Whats' bath time without the best toys to pretend and expand their imagination with?! The toys are cool but what do you do with them after they're sopping wet is the question - find a nice storage container that is discrete and can also drain! You dont want mold to begin accumulating. The one we have is by the brand Boon and they come in different bug and animal Were not quite at the stage of Bella using a small toilet seat so we dont have that in her bathroom yet, but when we do get one it'll be important that it stores easily. 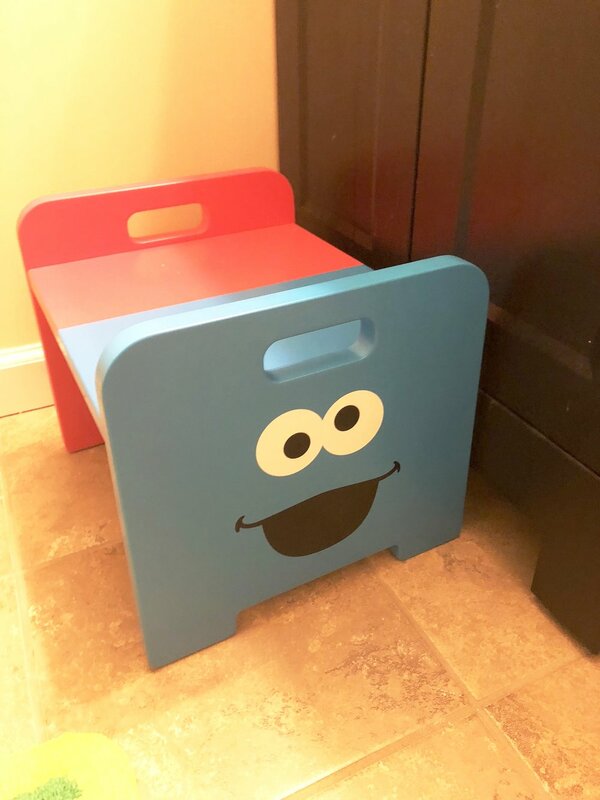 For the teeth brushing crazed child in your life why not have a fun step stool to make teeth brushing and hand washing more exciting! This cute solid wooden stool was perfect for our theme. Not to mention that the quality is unmatched. Listen, this mama is here for anything that will help my child do something willingly and with little fuss. Lately, her thing has been sucking the water from her washcloth (gag!) then smacking her lips...to avoid a belly ache or worse I found these cute shower poofs with Elmo & Cookie Monster at a Shop Rite in NY - I could not resist! Try some of these tips to help your little ones get excited for bath-time and have an interest in all bath duties!